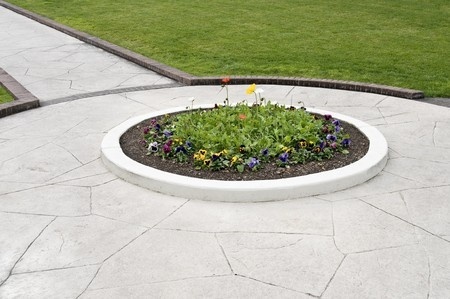 Stamped concrete has added inherent strength and endurance over conventional concrete. When properly installed and maintained, even when exposed to harsh winter weather conditions, stamped concrete is much stronger than many of the most common decorative stone alternatives, and provides a consistent, stable option for outdoor patios, walkways and more. A complete concrete installation will include a protective sealer application designed to block dirt and chemicals penetration, and prevent oil and grease stains. These stains are not only unsightly, but will degrade the strength and compromise the integrity of concrete. Quality sealer not only protects from contributing decay factors such as these, it also makes the concrete easier to clean. Traditional protective sealer is strengthened with color hardener. The color hardener makes the surface much stronger and resistance to abrasion and water penetration. In addition to this, it also is useful for enhancing the color and limiting UV exposure and fading. Even properly sealed, stamped concrete will require some routine maintenance. You should always sweep and wash the surface occasionally to avoid dirt buildup. Pressure washing and scrubbing with a mild detergent are the best means of maintenance. After a number of years, enlisting professional recoating services will restore the luster to your concrete. There are also floor waxes and polishes available to provide extra protection in addition to the sealer. The most important component to regular maintenance is simple regular cleaning. Want to learn more about stamped concrete installation and maintenance? Here at Templin Concrete Construction, we specialize in providing homeowners with durable, long-lasting stamped concrete driveways and patios. Give us a call today at 612-388-1945 for more information.